Microscopes are used to view items that are invisible to the naked eye and are thus used as scientific instruments for investigating and understanding the subject in question in a microscopic way. Automated microscopy adjusts and determines the light shutter, wavelength selection, focus and stage control, illumination source for live-cell imaging and software for live-cell imaging in an electromechanical way. Presently the global automated microscopy market is showing a steady growth rate due to the rapid technological advancements, increasing number of application areas and rising government funding in emerging application areas like nanotechnology. Owing to these reasons, the global market is projected to progress at a CAGR of 8.5% between 2016 and 2024. Analysts anticipate that the global market will be worth US$8.05 bn by the end of 2024 from at US$3.86 bn in 2015. Automated microscopy find its application in a number of applications such as medical diagnostics, nanotechnology, material science, life science and semiconductors. Life science applications holds the leading market share among the other application segments. Microscopic devices have been the most vital tool to researchers in the field of life sciences to explore the mechanism of diseases at a molecular level, to construct a three dimensional structure of tissues and to understand the microstructure of the tissues and cells. Microscopy also has applications in the medical world for surgeries relating to ophthalmology, gynecology, urology, otolaryngology, plastic and reconstructive medicine and dentistry. Based on the product type the automated microscopy market is segmented into two broad categories; by product type, and by application. By product type the market is further segmented into optical microscopes, electron microscopes and scanning probe microscopes. The optical microscope segment is further segmented into inverted microscopes, stereomicroscopes, phase contrast microscopes, fluorescence microscopes, confocal scanning microscopes, near field microscopes and others. The electron microscopes market is further segmented to Transmission Electron Microscopes (TEM) and Scanning Electron Microscopes (SEM). Whereas, the scanning probe microscopes segment comprise Scanning Tunneling Microscopes (STM) and Atomic Force Microscopes AFM). Optical microscopes are extensively used in fields such as microelectronics, material sciences, nanophysics, pharmaceutical research and biotechnology. For example, optical microscopes in material sciences, which use nanophysics extensively, are used to identify the metal or the alloy used, to analyze the results of heat treatment, which is used to improve the physical properties of an alloy, to examine metal surface coating, and for dimension analysis, apart from many other uses. In microelectronics, optical microscopes are used to analyze densely populated circuit boards for imperfections and determination of possible new designs. Optical microscopes have many variants depending on the designs. 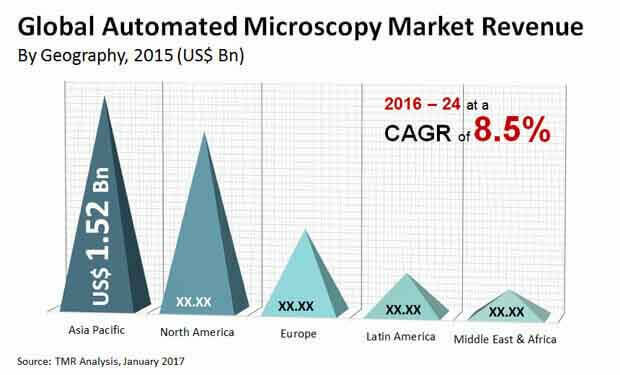 The major drivers driving the global automated microscopy market includes ongoing miniaturization in semiconductor and electronics industry, developments in nanotechnology and rising demand for affordable renewable energy sources. Increasing global focus on research and development for application areas such as nanotechnology, material science and semiconductor industry would enhance the adoption rate of advanced microscopes such as automated electron and scanning probe microscopes. These microscopes offer image resolution as high as 0.1 nm, which is essentially required by these precision manufacturing industries. Moreover, scanning probe microscopes, which are not dependent on the wavelength of light source for magnification are suitable in liquid and gas environment and can view both conductor and insulator specimens. Increased adoption rate of these advanced microscopes by precision manufacturing industries would drive the global microscopy devices market significantly during the forecast period.